And remember: If you bring your own bike, register it at the Swiss post office for $5, which gets you road tax and insurance – just in case you bump into a cow. Warm up the legs by cycling along Geneva’s River Rhône, with frequent pit stops at the chi-chi emporiums (Cartier, Christian Dior, Chanel) on nearby Rue du Rhône. Find affordable biking clothes and a huge selection of, yes, Swiss Army accoutrements at the six-floor department store Manor, and be sure to break for lunch at Taverne de la Madeleine, Geneva’s oldest café (over 400 years old, in fact). Munch on filets de perches (lake perch) right from the lake, but forget about beer – the local temperance league owns the “tavern.” Finish the day at Hôtel des Tourelles (around $150 a room), where the balconies overlook the tallest – 140 metres! – water fountain in the world. The road to Lausanne is pure Swiss bliss: 65 kilometres of hillside century-old vineyards, generously dotted with towns and, most importantly, bakeries (essential for emergency chocolate truffle stops). In Lausanne, trudge up cobblestone streets to Place de la Palud, a medieval courtyard complete with a storytelling mechanical clock (which re-enacts historical vignettes on the hour) and food markets every Wednesday and Saturday. Behind the Palud, 150 medieval steps lead to Cathédral Notre-Dame, Switzerland’s largest gothic cathedral. Inside are eerie crypts, ominous gargoyles and claustrophobic stairwells. Climb to the top for a view of the city and Evian, France, across the lake. Later, for the mere price of a 35-minute ferry ride ($17 on foot, $25 with bike), you can fill your water bottles from a bonafide Evian mineral water fountain! From Lausanne, ride your horse, err, bike, 5 kilometres past Montreux (the Swiss Riviera) to Château de Chillon. This 13th-century castle gave dungeon-bound prisoners fantastic lake views through barred windows, and the striking environs have long ignited the imaginations of visitors. In fact, Lord Byron was so taken with the story of François Bonivard (chained to a pillar for four years) that he wrote the poem Prisoner of Chillon and carved his own name into the wall. 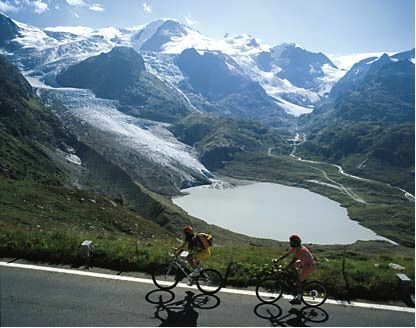 Swiss trains love bikes: Take yours for a mountainside tram ride to Leysin from nearby Aigle – or bike the vertical, lung-popping 15 kilometres. (Tram fare is $6 for rural areas, $12 for intercity. Check availability during rush hour.) Once a mecca for fresh air-seeking tuberculosis patients, the village is now full of outdoors enthusiasts. After hiking or skiing the 2,000-metre mountaintops, you’ll be ready for the customary finale: Swiss fondue (made with Gruyère cheese from its namesake Swiss town). Visit the 400-year-old La Fromagerie restaurant, where owner Madeleine Vagnières serves 300 fondues on busy nights. Or try her Fondue Bacchus: veal cooked in spiced wine ($38). From La Fromagerie, climb up to the Hiking Sheep Hostel, which serves as home base for exploring a labyrinth of skiing and hiking trails in the Swiss Alps. Meet fellow travellers at the communal kitchen in this quaint Victorian home. Past the hostel, hike through cowbell-clinking meadows. Hours later, stop for a well-earned supper at Kuklos, a revolving restaurant at La Berneuse ski resort. This laidback (self-serve or sit-down) all-glass modern marvel rotates once every 90 minutes, giving diners a panoramic view of Mount Blanc, the Eiger Mountain and Lausanne. Fearless? Keep hiking, hand over hand, up a chain-linked rope to the peak: Tour d’Ai measures a whopping 2,331 metres. The Swiss Alps are within easy reach! Take advantage of our convenient flights to Munich and Frankfurt, and daily codeshare service to Geneva with our Star Alliance partner Lufthansa. Plus, get great hotels stays and car rental deals.